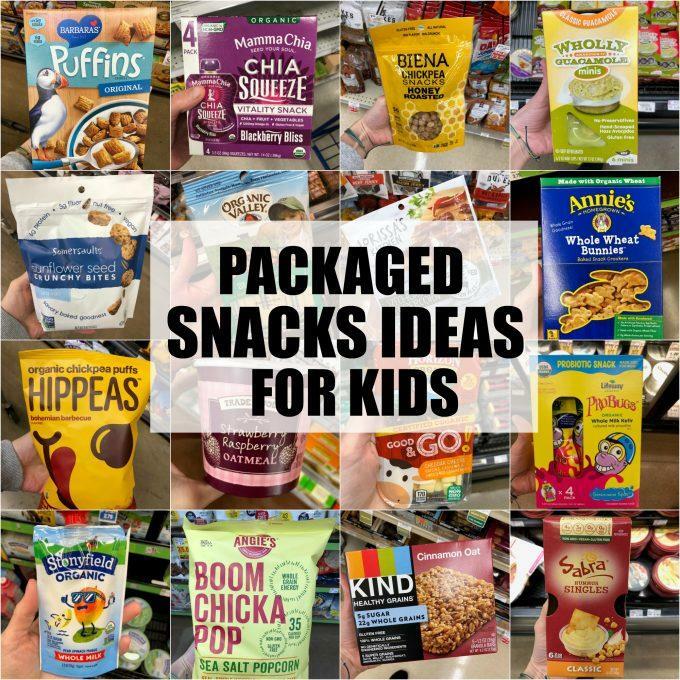 This list of healthy packaged snacks for kids (and adults too!) is meant to provide inspiration for busy parents who are looking for some new ideas. Homemade snacks are great but there are also some good store-bought options available! 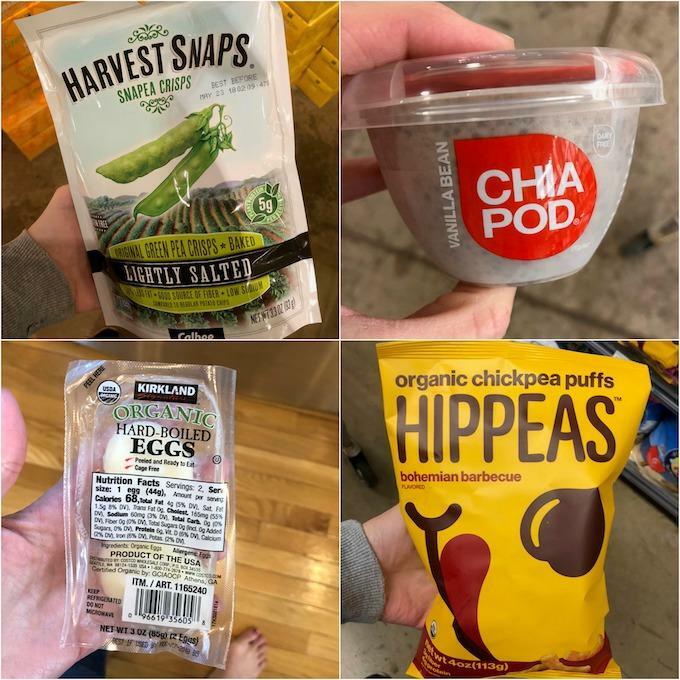 If you’ve been following my Instastories, you know that over the past week or two I’ve been sharing some healthy packaged snack ideas. 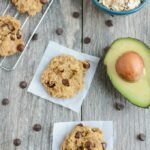 You guys know I’m a huge fan of making homemade snacks for my kiddos, but there are definitely times when store-bought options are both handy and necessary. 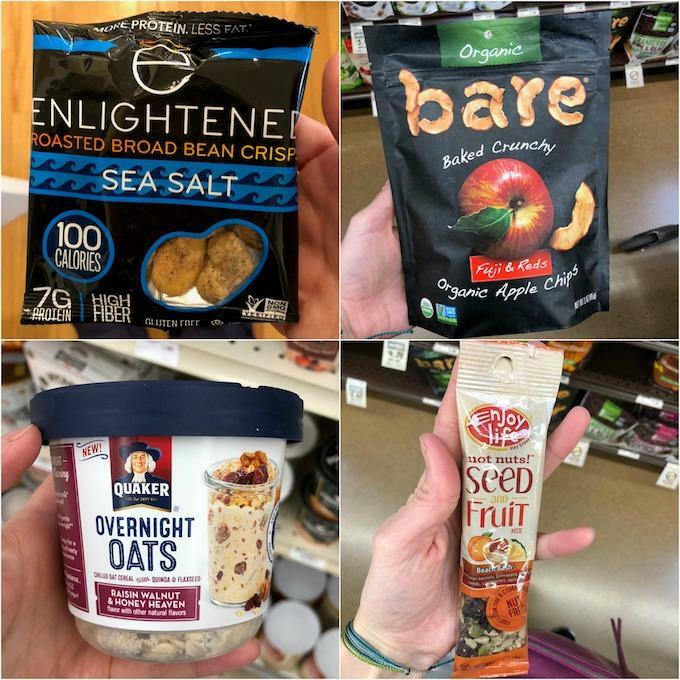 I also recognize that not everyone enjoys or has time to make homemade snacks and I’ve had lots of requests for my thoughts on healthy packaged snack options. 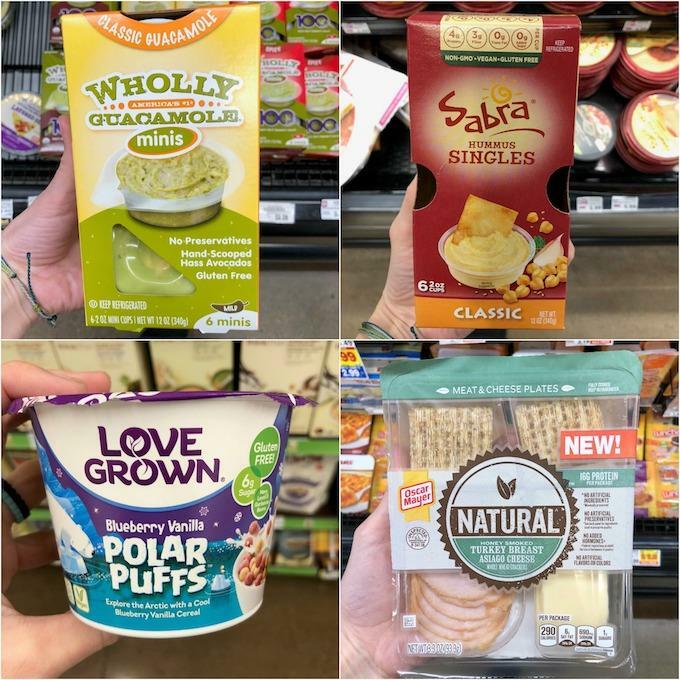 So, in the past couple weeks, I visited Meijer, Kroger, Giant Eagle, Costco, Fresh Thyme, Trader Joe’s & Whole Foods to round up some ideas for you. 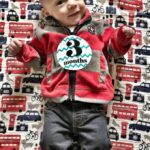 Some trips I had one or both kids with me, which limited my browsing capabilities…but I also took a few solo trips. I managed to collect 60+ ideas to share with you guys today. This is not a sponsored post. None of these companies asked to be included or even knew I was putting this post together. While I originally intended this round-up to be geared towards kids, there are a lot of things adults could enjoy as well. We have not tried all of these. I repeat – I have not personally tried all of these, nor have my kids. I have no idea if my kids like them all and have no doubt there are some they would not eat. I firmly believe everyone is entitled to their opinions about what makes a healthy snack. 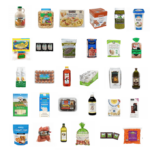 The products I’ve chosen are ones that I think are good choices both as a Registered Dietitian and as a mom of two young kids (ages 3 & 15 months). I have no doubt there are people (even other dietitians) who will disagree with products on this list. That’s fine! I’m not saying these are things you have to feed your kids. 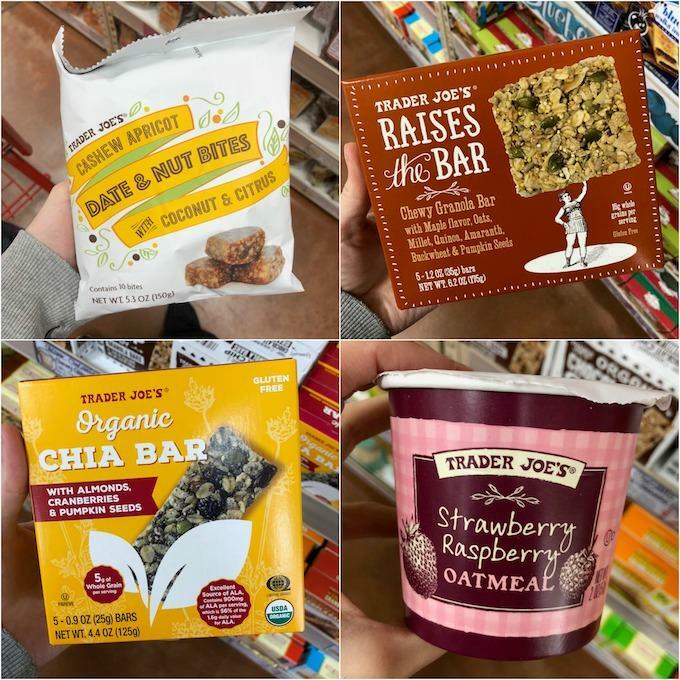 I’m not even saying these are the only healthy packaged snack options. I know there are tons more out there and I will continue to add to this post as I come across more! I’m simply sharing these ideas to inspire you and hopefully help you find a few new options for you to try with your kiddos. 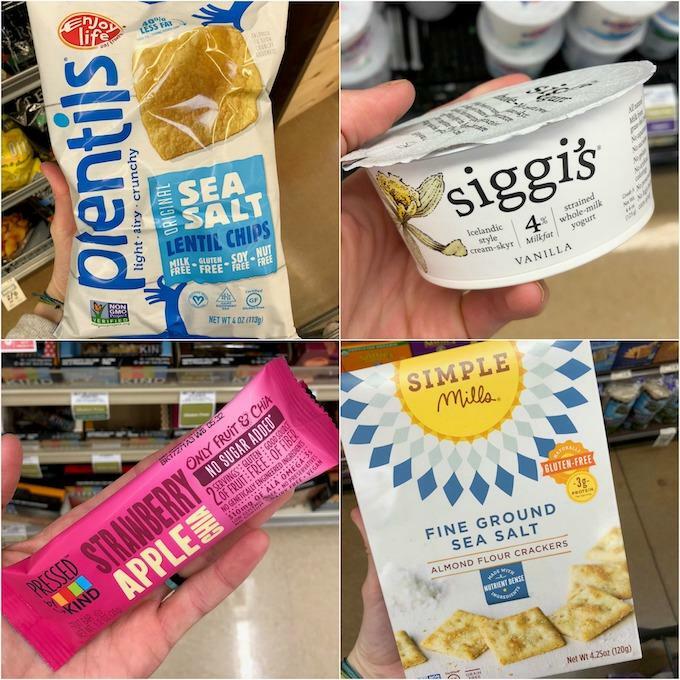 When I’m looking at packaged snacks, I try to find options that have at least a few grams of protein and fiber, and I try to choose options that are low in added sugar. I don’t have a set-in-stone rule, but generally, if there are at least 3 grams of protein and/or fiber and less than 5-6 grams of sugar (although some are higher due to natural sugars in fruit, milk, etc), I’m pretty happy. I tried to link to the specific product I showed in the pictures so you can click the link and see the nutritional info. I took pictures of all the labels but they got blurry and hard to read when I tried to include them in the collages. If you visit my Instagram profile, I have most of these (and the labels) saved to my highlights so you can click through them there too. Sabra Hummus Singles – perfect for dipping mini carrots, snap peas, red peppers strips or crackers! 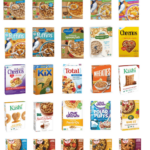 Love Grown Foods Polar Puffs – bean-based cereals. Buy a big box to portion yourself or snag the cups. My kids also like the Fruity Sea Stars. Lunchables – lots of different brands have something like this available. Remember that you could also easily make a week’s worth of these yourself by buying a box of Triscuits, a block of cheese and your favorite low-sodium turkey! Stonyfield Organic Whole Milk Pouches – love that these are whole milk and have some veggies. There’s also a Berry Beet flavor. They also have whole milk smoothies which are a bit high in sugar for me but great for an occasional quick, on the go protein option. 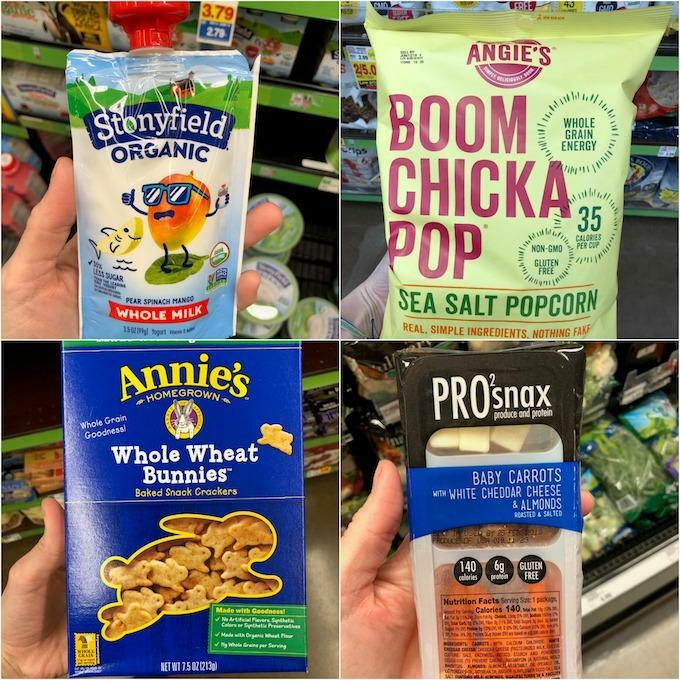 Angie’s Boom Chicka Pop – The sea salt flavor has no sugar. 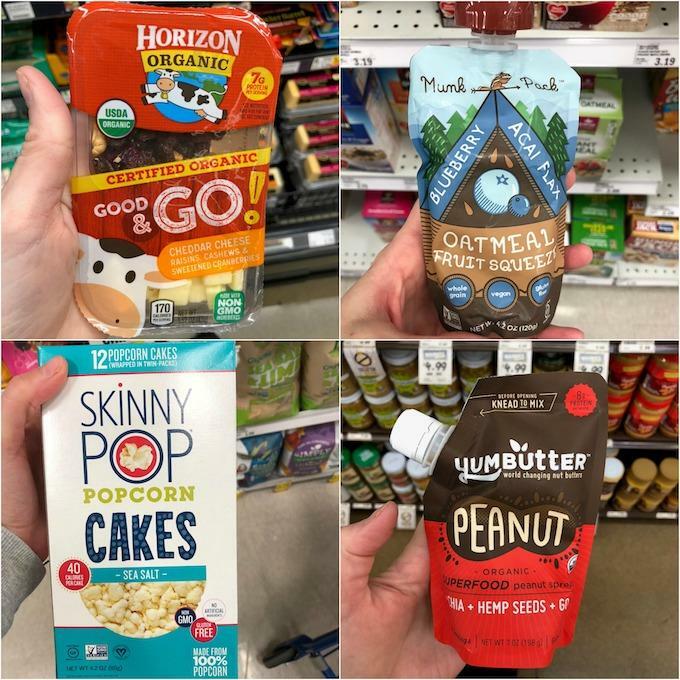 Just popcorn, oil and salt…and each serving has 3g protein, 4g fiber and it’s a whole grain! 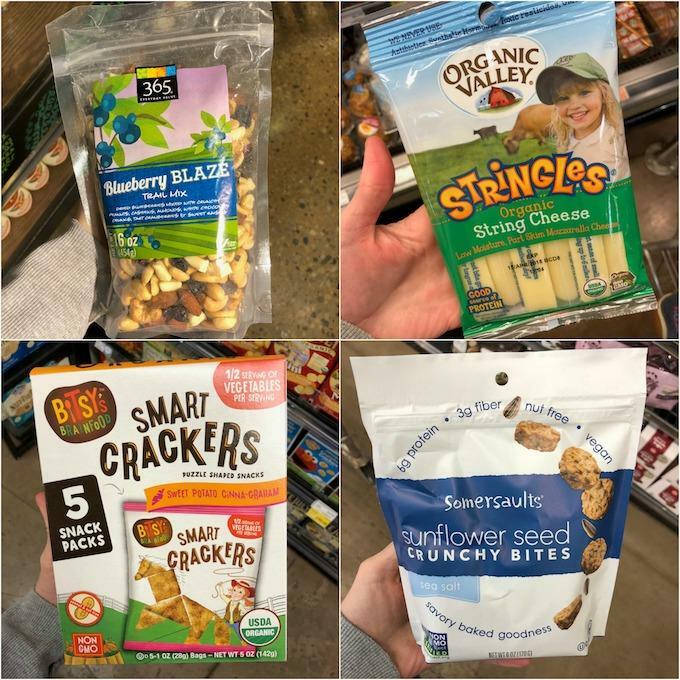 Buy a big bag and portion into small bags for snacks on the go. Annie’s Whole Wheat Bunnies – love that they’re whole wheat and baked! Fruit/veg, nut & cheese packs – Available in a lot of combos from different combos. Again, you could easily make several of these yourself fairly quickly at home with a bag of nuts, a blog of cheese and a bag of baby carrots. Horizon Organic Good & Go! – Another combo you could make at home but these are a great grab and go option. They have a few different flavor combos! Munk Pack Fruit & Oatmeal Squeeze – no added sugars, plus some protein and fiber and simple ingredients. Lots of different flavor combos too! Skinny Pop Popcorn Cakes – Fun to eat, a good whole grain option. YumButter – pair it with an apple. Fun to dip and eat! They also have combos made with different nuts and seeds. Lifeway Kefir – love the 8 ounce size for a drinkable on the go source of probiotics and protein! Mamma Chia Chia Squeeze – easy way to add some fiber on the go! Made In Nature Figgy Pops – love all the products from this company. 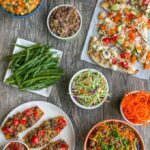 So many great flavors, all made with simple ingredients! 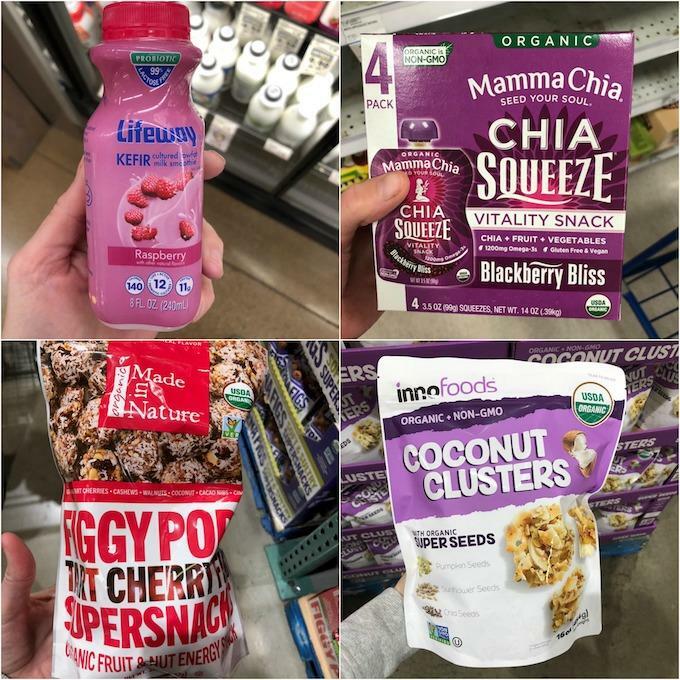 InnoFoods Coconut Clusters – I saw these at Costco. Nut-free option! You can also buy them on Amazon. Lifeway ProBugs – No-spill pouches for on the go! Protein and probiotics. Enjoy Life Grain & Seed Bars – A nut-free option. My husband loves these. Triscuits – Staple cracker in our house. Pair with veggies, hummus, cheese, etc. 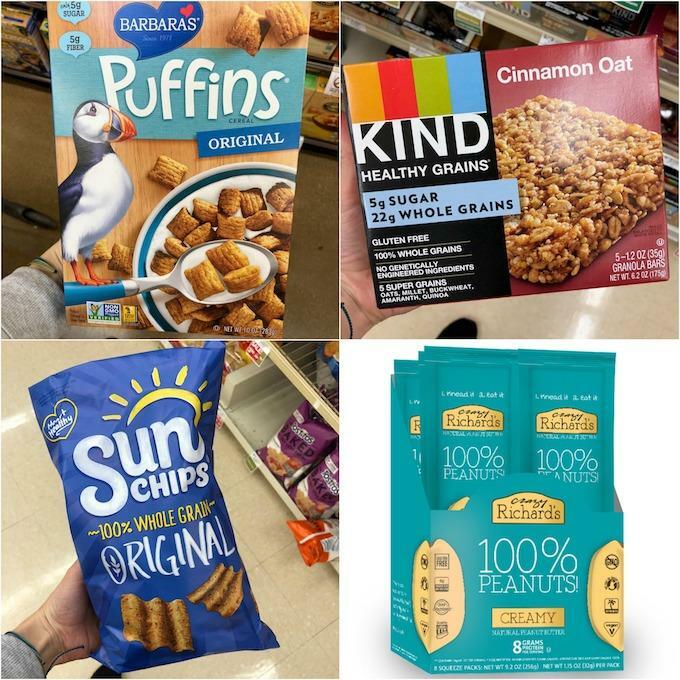 Quaker Breakfast Flats – not my first choice because they’re a bit high in sugar but a good occasional option and they do have whole grains and some protein and fiber. Barbara’s Cinnamon Puffins – Another low sugar cereal that my toddler loves! KIND Cinnamon Oat Bars – A good one to stash in your purse for snack emergencies. Sun Chips – tend to be a hit with both adults and kids! Crazy Richard’s Singles – spread it on bread or crackers, dip fruit slices in or eat it plain. 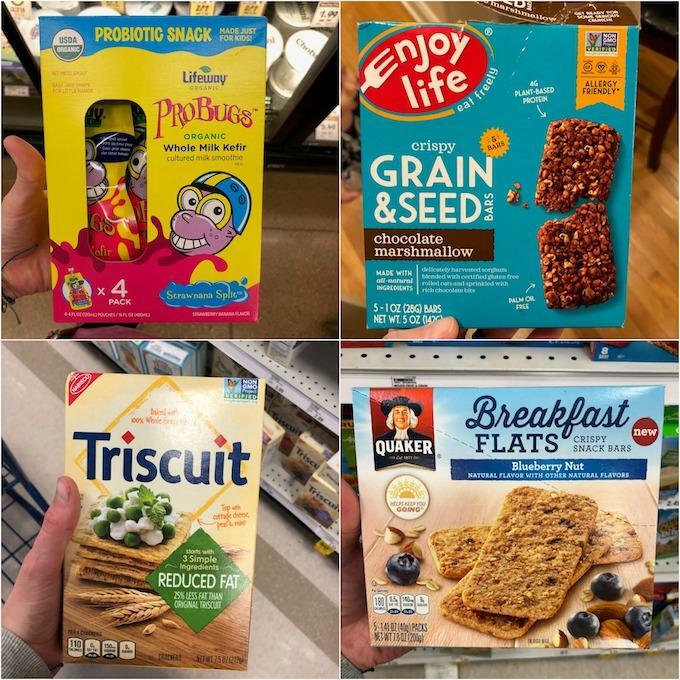 Enjoy Life Foods Plentils – Crunchy, have some protein, come in a bunch of flavors! Siggis 4% – low in added sugar, simple ingredients! They also have 4% tubes that my kids love, especially frozen! Pressed Bars by KIND – just a few ingredients, chia seeds to add fiber! Simple Mills Crackers – gluten-free, almond flour crackers with minimal ingredients. Several different flavors! Enlightened Broad Bean Crisps – Great source of protein & fiber. I love mixing the cinnamon and the sea salt ones. Bare Apple Chips – Just apples. Super crunchy. Great for dipping in PB. Quaker Overnight Oats – A bit high in added sugar for me, but I like the concept. 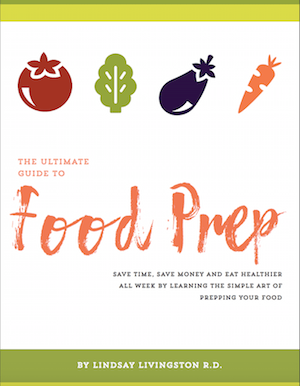 You could easily prep 5-6 of something similar with oats, nuts and dried fruit in mason jars and just add your milk or yogurt the night before you want to eat! Enjoy Life Seed & Fruit Packs – Nut-free trail mix option. Half Pops – A crunchier way to eat popcorn. Better for older kids and adults. Cinnamon & Sugar SuperSeedz – Eat them plain or add to homemade trail mix. Other flavor options available! Nut-free! 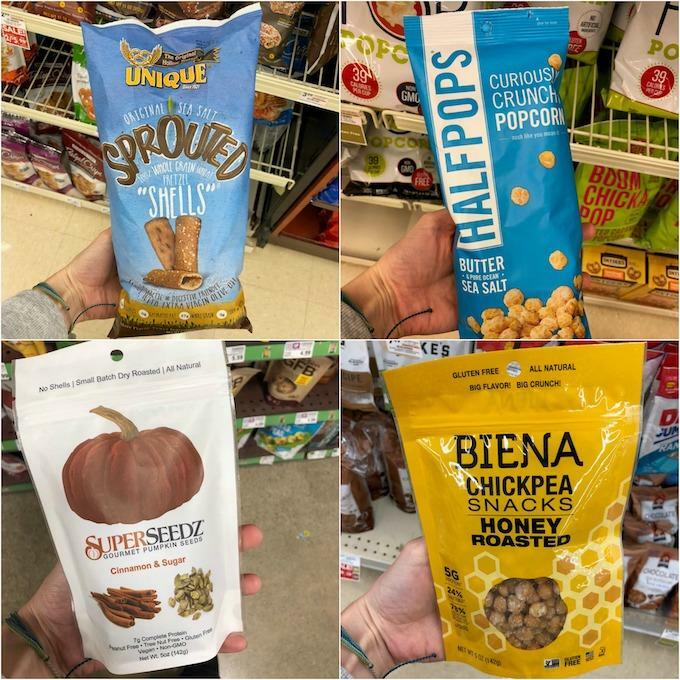 Biena Chickpea Snacks – Another nut-free option for protein and fiber. Good by themselves or in a mix. Multiple flavor options. 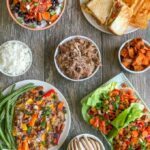 Lorissa’s Kitchen – Lots of great flavors. Store it in your purse or in the car for on the go! They also make sticks! Chomps Grass-Fed Beef Sticks – I found these at Trader Joe’s. They also have them on Amazon. Squish loved. Bamba Peanut Snacks – Easy way to introduce young kiddos to peanut butter. I saw a few other brands making something similar when i was at FNCE last year so I’m sure there are other similar options. Oatmeal Cups – Only ingredients are oats, brown sugar, freeze-dried fruit and cinnamon. 9g protein, 6g fiber and 5g sugar. 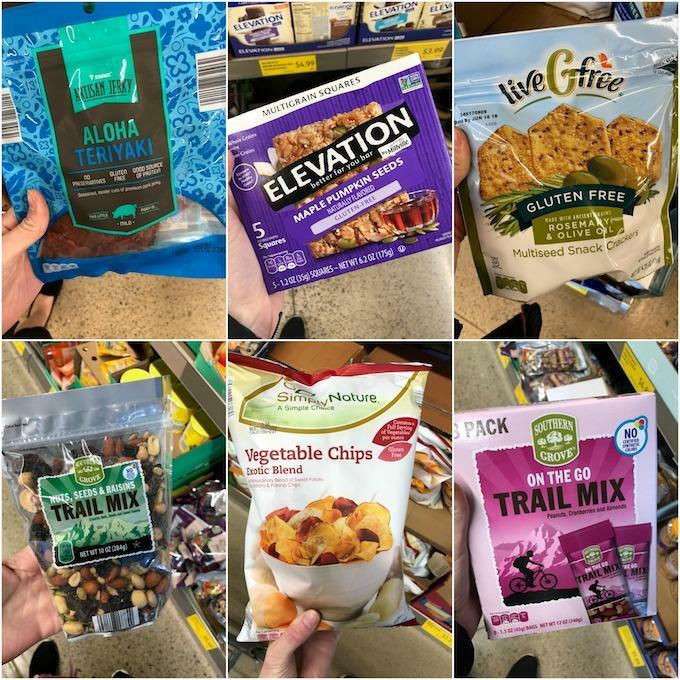 Trail Mix – I look for a good mix of nuts, seeds & dried fruit. Bitsy’s Brainfood Smart Crackers – Nut-free and baked into shapes you can play with! Lots of flavors. 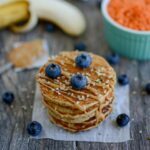 Somersaults – Nut-free with lots of protein and fiber. Rhythm Superfoods Kale Chips – A crunchy and flavorful way to try to get some veggies in. They also make beet chips and carrot sticks! Natierra Freeze-Dried Peas – Great, nut-free protein source. Would be great mixed with a few other things in a trail mix. Beanitos White Bean Chips – Serve with guacamole, hummus or salsa! Good source of protein and fiber. Harvest Snaps Snapea Crisps – Another good protein source! Chia Pod – Dairy-free with protein and fiber. Available in different flavors. Hard-Boiled Eggs – Lots of companies make them. Pair with a healthy carb! 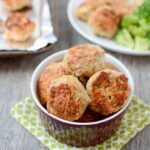 Hippeas – kinda like an amped up cheese puff! Lots of fun flavors. RW Garcia Sweet Potato Crackers – pair with cheese or hummus for dipping! 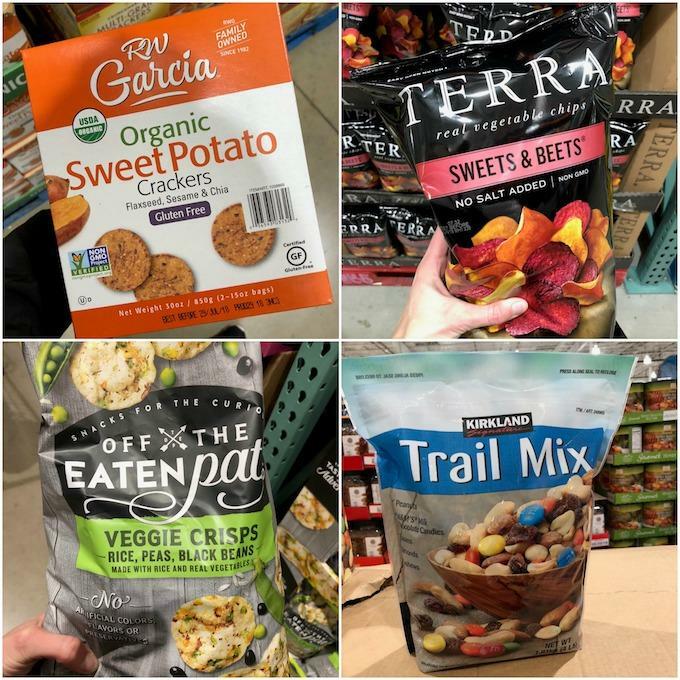 Terra Sweets & Beets – Great way to add some veggies! 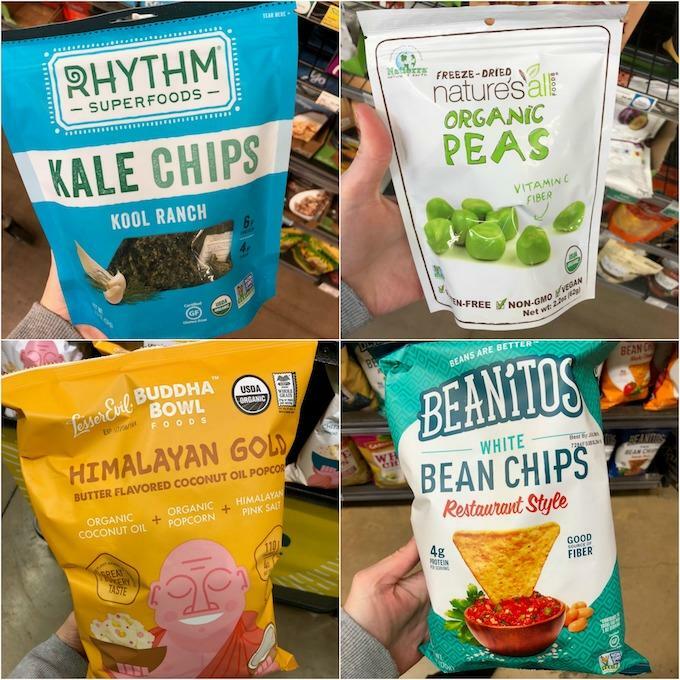 Off The Eaten Path Veggie Crisps – a few different flavor options! Here are a few I found specifically at Aldi. That’s it for now! I’ll keep adding as I find more! If you liked this post, be sure to share and pin it for later! 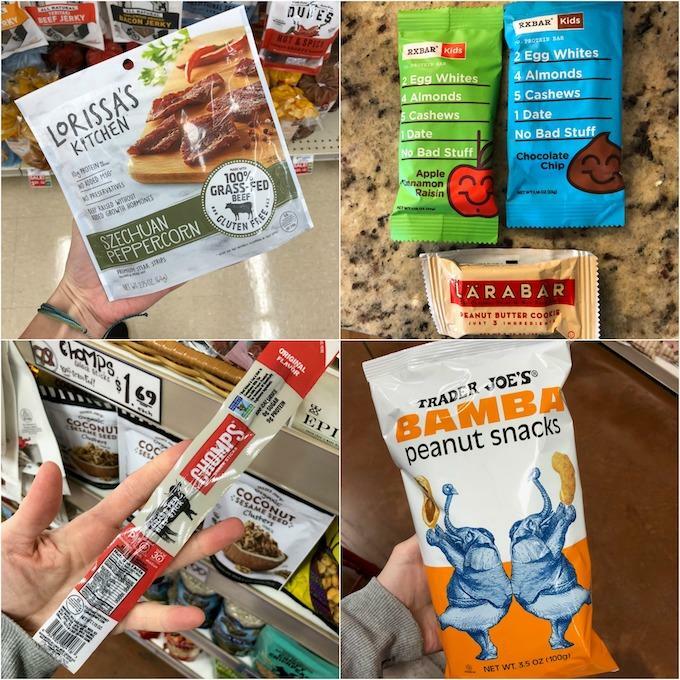 What’s your favorite packaged snack? Leave a comment so I can check it out! You are seriously the best! 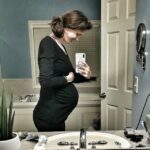 I can’t wait to really dive into this post and find some new snacks to try out for my son! You’ve done all the hard work for us! hope you find some good ones! I love this list! Thank you for taking the time to search stores and make this list!